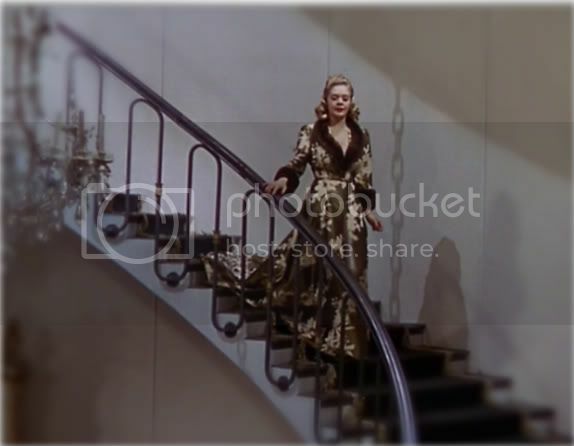 Welcome to week four of Musical Month here at Film Fashion Friday. 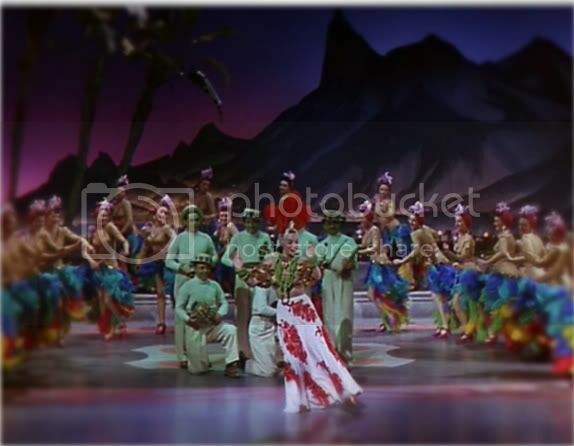 This week's selection, That Night in Rio, comes from 1941 and has an all star cast, including Alice Faye, Don Ameche, and Carmen Miranda. This film was pretty cute, plot-wise and very extravagant costume-wise. Don Ameche plays an actor who impersonated a baron, whom Ameche also plays. 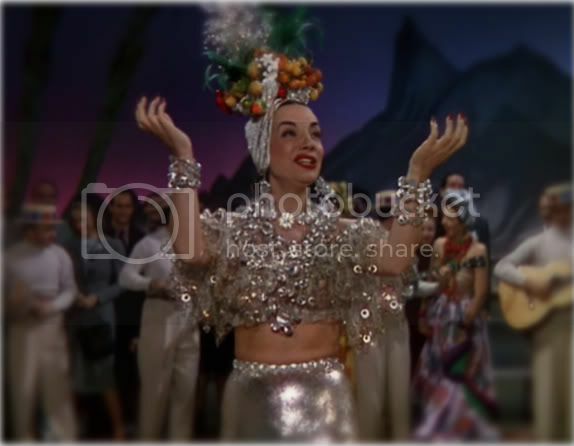 The actor is in love with Carmen Miranda, but also tends to have a wondering eye. Coincidentally, so does the baron. 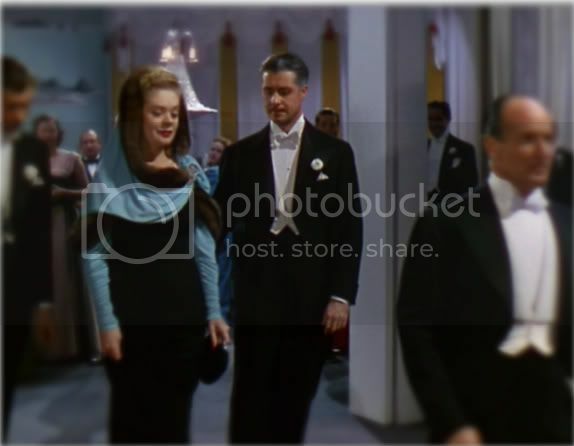 The baron is married to Alice Faye and you find out early in the film that the baron is having some money trouble, which this carries the plot. The story is cute, but nothing super special. 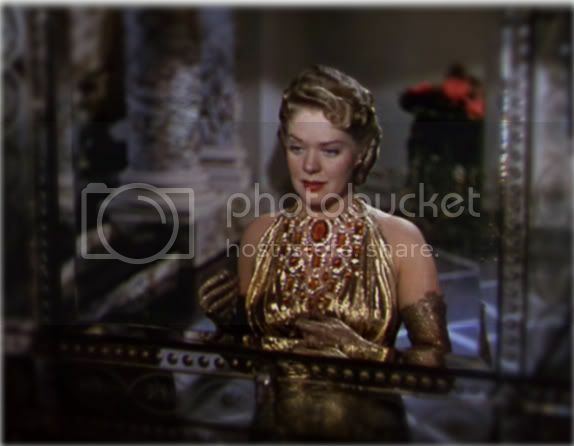 There is, however some great early special effects where it appears that the baron and the actor are both on the screen at once, both embodied by Ameche. There are also some great musical numbers by Miranda. If you haven't seen any of her films, this is a great one to start with. The costumes were designed by Travis Banton, who I have featured here before. Banton really has a keen eye for elaborate styles and that is apparent in this film. Since the film was released in 1941, I am assuming the great attention to detail on the over-the-top costumes was done in an effort to boost homefront morale. Regardless, I am really loving the zany skirts and hats worn by Miranda. While it may not be fully appropriate to dress like this on any day other than Halloween, you can still channel this look by wearing several bangles or several necklaces at one time, to add a little zest to your vintage dress. I am also loving Faye's hair-do that she dons while wearing the gold dress. I might just have to send a request into LisaFreemontStreet!! 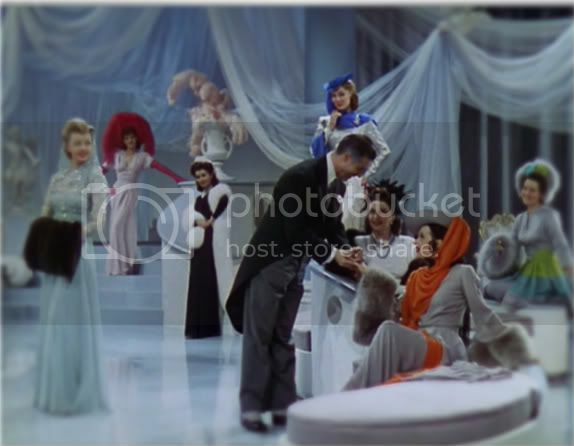 And gals, do take note of the second musical sequence; it is full of women dressed in their 1941 best. Grable stars as a girl who impersonates a heiress in an effort to attract a rich man to support her aunt and sister, who are also in on the act, posing as Grable's maid and secretary. She ends up falling for two men, one who is actually rich and one who is putting on front like her. Can you guess who is lying?? Those are great stills from the movie -- they have an almost 3-D quality to them. I can't remember seeing Moon Over Miami. I'll be on the lookout for it.